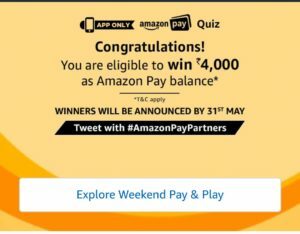 1 Win Rs 4000 pay balance on Amazon Pay Quiz Answers Today April? 2.1 Q1) How does Amazon Pay Weekend Pay & Play help you enjoy your weekend? 2.3 Q2) What is the max. cashback you can get can through Weekend Pay & Play offers this weekend? 2.5 Q3) When should you visit the Weekend Pay & Play page for your dose of exciting offers? 2.7 Q4) Amazon Pay Weekend Pay & Play brings you deals on your favorite apps & websites. Which of the below do NOT accept Amazon Pay yet ? 2.9 Q5) You can use your Amazon Pay balance to pay for your orders with a single click across participating sites? Amazon is continuously conducting quiz to promote its services like Amazon Pay Quiz Answers Today 21 April, Amazon Pay Wallet, Amazon Recharge. And in the month of April, Amazon is asking questions about its wallet – Amazon Pay. You just have to answer 5 questions to get Rs 4000 Amazon Pay Balance. 50 contestants will get the prize for this quiz. Check the answers to all the questions in the below post now. You can use Amazon Pay Balance for shopping at Amazon.in, Recharge and payment at other merchants. Some of the merchants that accept Amazon Pay Balance are Bookmysho, Haptik, Niki, Redbus, etc. They also give great cashback offers on adding money to the wallet. So, check all the answers of the Amazon Pay Quiz. 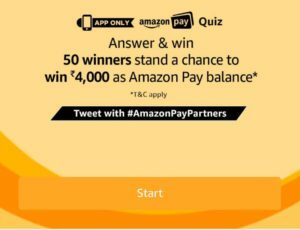 Win Rs 4000 pay balance on Amazon Pay Quiz Answers Today April? 2. Open the app and you will see a banner about the Amazon Pay Quiz Today Answers April answer. Click on it. Q1) How does Amazon Pay Weekend Pay & Play help you enjoy your weekend? Q2) What is the max. cashback you can get can through Weekend Pay & Play offers this weekend? Q3) When should you visit the Weekend Pay & Play page for your dose of exciting offers? 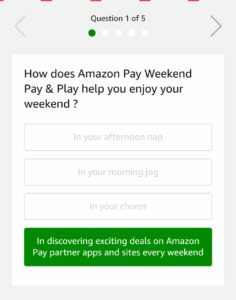 Q4) Amazon Pay Weekend Pay & Play brings you deals on your favorite apps & websites. Which of the below do NOT accept Amazon Pay yet ? Q5) You can use your Amazon Pay balance to pay for your orders with a single click across participating sites? 5. After answering all 5 questions correctly, you will get a Congratulations message that you have been entered into a lucky draw. There are a total of 50 (Fifty) Prize(s) that will be given under this Contest. The Prize will be delivered to the winner on or before 30th May, 2018. 1. This Contest will commence on 21st April 2018 from 12:00:01 a.m. (IST) to 30th April 2018 23:59:59 p.m.
3. Once you have signed-in to the Amazon.in App, you can participate by navigating to the page where 5 (five) quiz questions will be posted during the entire Contest Period. After answering all the question.. Tweet is also required? I have won 5 quizzes and what I have to do now, tweet is also required to fulfill the eligibility criteria.